Vintage From Paul is delighted to offer these classic Corning Green Stripe Restaurant Dinner Plates. The Corning Green Stripe Restaurant Dinner Plates date to the 1950's. Each of the available Corning Green Stripe Restaurant Dinner Plates is in pristine condition. 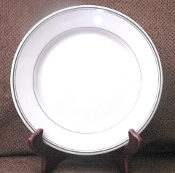 The Corning Green Stripe Restaurant Dinner Plates measure 9-3/8 inches in diameter. The back of the Corning Green Stripe Restaurant Dinner Plates is embossed with the Corning Glassblower &; "Corning Made in the USA 38."